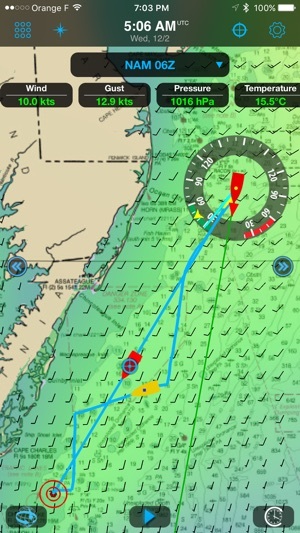 Weather4D Routing & Navigation integrates weather forecasting, routing calculations, navigation with digitized raster charts, instruments and data sharing to maximize your boating experience. 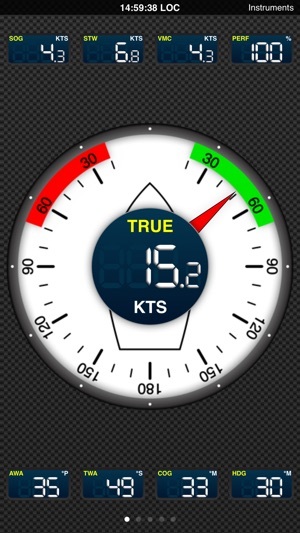 See SOG, COG, VMC, HDG, TWS, AWS, ETAs, ETWs, AIS data and more in real time along with weather and routing information with a wifi connection to a transponder. 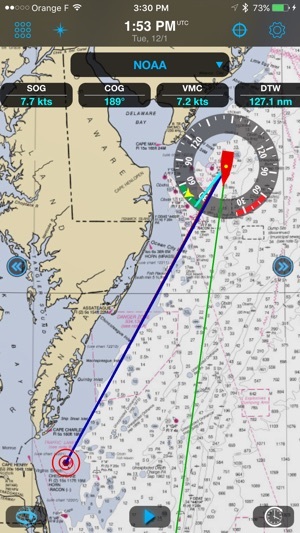 Store your subscribed digitized charts on your device for offshore/offline navigations. Set the screen to night mode after sunset to better see what’s happening outside during your watch. Set alarms to alert about low precision GPS signal, excessive XTE, course deviations, surrounding boats, excessive wind speed and low depth. Take advantage of the iPad/iPhone built in compass, pressure and acceleration sensors. Connect bluetooth devices like wireless anemometers and wind vanes. Share AIS and boat sensors data like wind, current, pressure, air and sea temperature within the Weather4D users community. Activate Man Overboard safety feature to estimate drift and thus rescue location based on current and wind. View combined weather data displayed in 3D HD layers animated automatically or manually by sliding a finger on the screen. 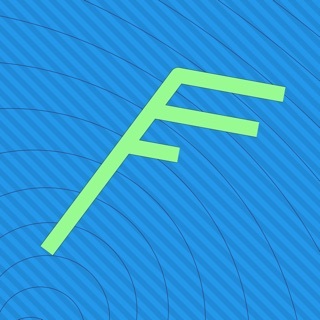 Use GFS model to get started. In addition, over 35 weather and oceanographic models are available with a yearly subscription (in-app purchase). Create your own geographical zones, select the models you need and download only the characteristics that matter to you: data type, resolution, periodicity, file size, etc. GRIB files can be downloaded anywhere through a regular or satellite internet connection. 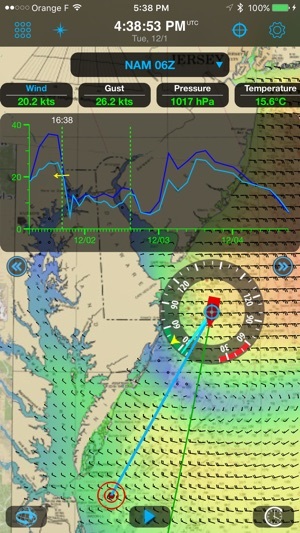 Split the screen (iPad only) to combine and/or compare: navigation and weather, weather and waves or currents, two weather models… The splitted screens can display charts at different scales. Routing calculation optimizes for safety, comfort and performance when sailing, motoring, or mixing the two. Create a route and calculate its associated routings in function of departure dates/times, forecasts (weather, wave and current), minimum sailing speed, motoring speed, boat polar, maximum wind and minimum distance to the coast. Visualize sail configurations based on your routings and your own set of sails. Save waypoints, locations, simulate routes, combine them with GRIB forecast models and thus get a holistic view of all the parameters affecting routing calculations. Restart a routing calculation at anytime from the actual boat position. 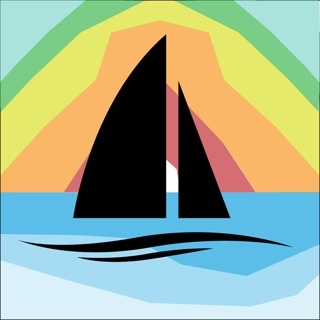 GeoGarage is Weather4D supplier and offers by subscription access to more than 10,000 nautical charts derived from International Hydrographic Services. Pricing and chart selection is done per publisher. Updates are released regularly under chart publishers authority. Once the subscription is purchased, charts are instantly accessible within the application. - Update of the World Magnetic Model (WMM 2015v2). 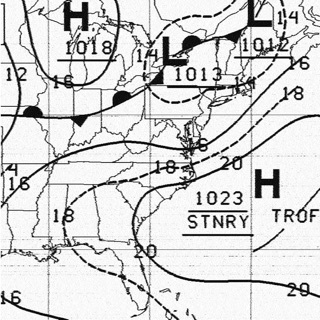 I used this program for a 1800 miles boat transfer (with the SHOM subscription and the weather model subscription). I found it one of the best programs in absolute I have ever seen. It is extremely solid, extremely well thought, a real pleasure to use in all weather conditions. Well worth the money and +. 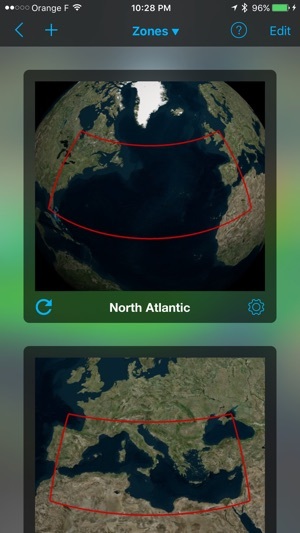 I just purchased the Routing and Navigation App on the recommendation of a friend. Although it looks like there is a steep learning curve, there is a free book on iTunes and I’ve gotten great help with quick and detailed responses via email from their support team. I’m looking forward to using the app for racing. © 2015-2018 Olivier Bouyssou All rights reserved.